I caught a little bit of Barefoot Contessa on the Foodnetwork the other day, and I saw her making this soup. This was just a potato leek soup, but when I watch her show, I get completely drawn in to whatever she’s making. It doesn’t matter if it’s something I don’t even eat, like beef tenderloin, I still become mesmerized. I’ll start thinking of how Kurt would like that, or I can make this when we have some friends over for dinner. Whatever Ina’s cooking, it always looks good, and I always want to run and cook it too. Potato leek soup is pretty straightforward, and I’ve made it many times, but Ina turned this version of it into something special. Instead of boiling the vegetables in the broth and then pureeing the soup, the vegetables were roasted in the oven. Potatoes and leeks were chopped, tossed with olive oil and salt and pepper and roasted until tender. Then, arugula was added to the pan and roasted until wilted. I cleared the end-of-season arugula from my garden last weekend and used the last small, upper leaves for this. The roasted vegetables were then placed on top of the stove, and wine and chicken stock were added. That combination was then pureed in a food processor, in batches, with additional chicken stock. Once pureed, it was returned to a pot on the stove, more stock was added to achieve whatever consistency you might prefer, and then the recipe started getting rich. An eight ounce container of creme fraiche was stirred into the soup along with some grated parmigiano, and three quarters of a cup of cream was suggested. Now, I do love Ina and I’m no prude when it comes to cream and butter, but I just couldn’t do it after the creme fraiche. I used two percent milk instead. Trust me when I say it didn’t weaken this soup. First you can control the thickness during the pureeing and adding of chicken stock, so I already had a nicely thick soup. And, the richness was definitely not lacking because of my milk substitution. Last, a little more wine was added and the seasoning was adjusted. The soup was served with crispy shallots on top and some parmesan cheese bread on the side. It was incredible. It had great flavor from the roasting, and the arugula added a little pepperiness and fresh, green flecks. The dairy richness and salty bite of the cheese were exactly right with the vegetables. Just watching it being made on television convinced me it would probably be good, but I had no idea. I wanted to curl up and take a nap in this soup. Dare I say, this may very well be the mac and cheese of soup. It is comfort food as it should be, and you can use the cream if you want, but it really didn’t even need it. I'm submitting this to the May PhD. Funny, we are back in synch again. I made potatoes and leeks with my chicken....close enough! Your soup looks so good, great for a cold rainy spring night in NJ. Lisa, I also enjoy watching Barefoot Contessa and as you said she draws you in to watch her. She does make some great food. I cannot say 'no' to potato and leek soup. It's raining here in NY where I'm on vacation. And potato leek soup would be the ideal thing right now to dig a spoon into. Yum, looks beautiful! I love the crispy shallots on top! I have a few pounds of ramps still sitting in my fridge and am thinking they may be getting turned into a soup after seeing this. Potatoes & leeks pair really well, & don't laugh but i love chopping leeks.. :-D those crispy shallots are delicious. Wow, this soup looks nice and creamy. I may need to try this soup. 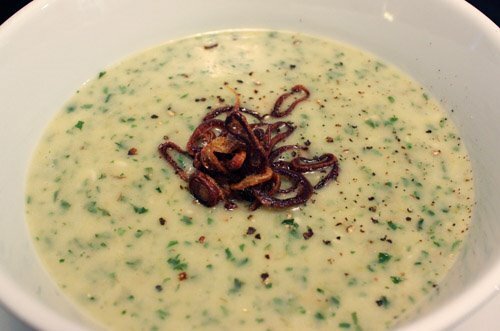 I love potato and leek combination, but it's the crispy shallots that make me weak in the knees. Must try. That looks awesome. I love the crispy shallots! Wow Lisa, the way you describe this sop make my mouth water. Love the addition of the fried shallots. mmmmm. i love the roasted leeks. sounds delicious! I love leeks and the soup sounds so creamy and delicious. This is so rich and creamy. Lovely flavors. I am 100% there with you on Ina. I don't eat half of what she makes (all the meat) and yet I still watch her and have four of her cookbooks. I saw this episode too and wanted to make it, but couldn't go there with how rich it looked. Good to know you can tone it down a little! i love the idea of roasted potatoes for the potato and leek soup. Sounds delicious! I saw her make this on tv too, I thought it looked great. Glad it came out so well for you! Nice soup...looks really tasty...such a nice treat! The pictures are great! Love a leek. They match well with taters. We love Ina too! She's always making something great. Love the creaminess and flavour of this soup. I just know it tastes great. Hi Lisa, how r u doing ? the mac & cheese of soup? that's high praise indeed! it certainly sounds delicious and i don't think it could be depicted any more beautifully. bravo! I have never made potato leek soup, but I have always wanted to. It intrigues me as well. Your's looks so appetizing. That looks delicious...especially the fried shallots! All I have to say is a double 'YUM'! This doesn't look like it needs any help from extra cream. It looks marvelous - my favorite part is probably the arugula. I'm a latecomer to the joys of these greens so I love seeing the different ways it can be incorporated in recipes. Way to totally upstage my plan to put my P&L soup this week. How am I supposed to compete with such a well written post and pretty picture??? Wonderful! I saw you over at the Ho-Down and had to pop over to see! I almost made my version of this soup but ended up putting it off. Yours is beautiful and unusual and I love it! How good does this look! I can't wait to try it. 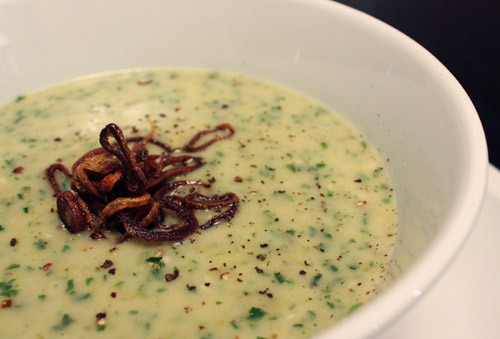 I made the other potato leek soup for this month's ho-down, and dare I say... I'm way crazier about your recipe. Looks yummy, and I can't imagine how any recipe that starts with roasted potatoes could go wrong. Great job. I finally made time to go back and look through the amazing May Potato Ho Down Roundup. I can't wait to try this soup recipe!! I don't use leeks alot but I love using them in soup; and roasted has to make them even better. One question...Do you think that the creme fraiche makes a difference or could you just use heavy cream? Wow, this looks delicious! I'm a big fan of Barefoot Contessa. Her recipes just work! Thanks for sharing this scrumptious soup! I love this recipe, not to mention your fabulous pictures! I'll have to give this a whirl. It just looks so delicioso!!! Besides, it's fun to try new ways to do the same old thing, right? one of my favorites...especially on a cold and rainy day. I just made this last night. It was awesome. I would so make it again.